Another product from Innisfree I have been trying is Innisfree Orchid Enriched Cream. Actually, this is the second times I have been using the Innisfree the Green Tea Seed Serum. I just want to write the simple review about this product based on my experience. I bought this product by the Innisfree Christmas Box while I holiday in Seoul, Korea last November 2017. This Christmas box price is KRW 45,000. I got the Innisfree the Green Tea Seed Serum (80 ml), Innisfree Orchid Enriched Cream (20 ml), Innisfree Green Tea Sleeping Pack (30 ml), Innisfree Black Green Tea Mask (30 ml), and Innisfree Green Tea Mineral Mist (50 ml). 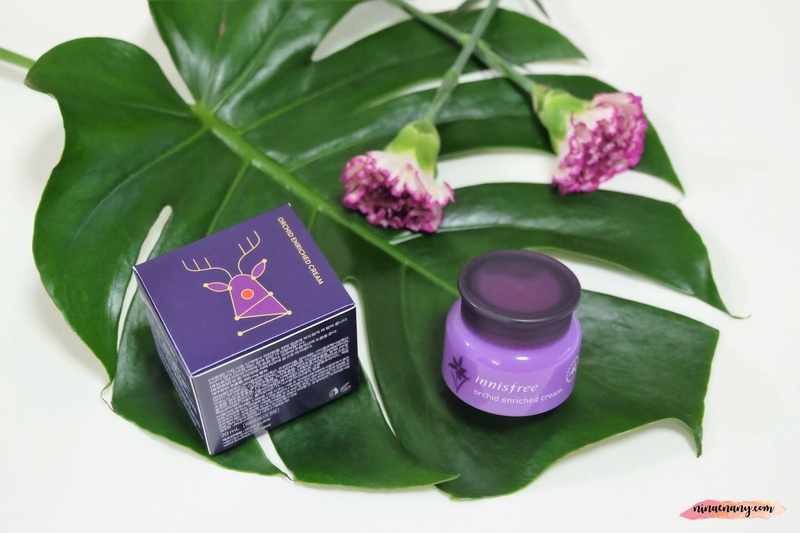 The Innisfree Orchid Enriched Cream is an anti-aging cream with Jeju Orchids to give you looks younger and healthier skin. A superior antioxidant ingredient extracted from Jeju Orchids makes skin glowing and radiant while strengthening. It is all-in-one care by providing full nourishment, it tightens, it tightens skin, reduces wrinkles, and brightens the overall skin tone. Based on my experience, I feeling nothing different on my skin or maybe slightly different that I can't tell the difference before and after use it. But I only can tell that I feeling a little bit oily after using it within 3 hours. It's maybe because my skin type is combination and oily so it makes my skin looks oily after 3 hours. I did not really like it because this cream not really helps to control my oily factor. So far, I think this cream is for dry skin type and it's really helped reduces wrinkles for ladies above 30s. Sometimes, stress can be the main factor ladies have wrinkles on their face so it can be the best cream for ladies. I would like to give 3.5 stars out of 5 stars to this product.